Just got back from seeing Avengers: Infinity War. I expected I might need time or additional viewings to unpack the movie before I wrote about it, but it turns out I don’t. People told me to avoid spoilers, which is impossible because I’ve been reading Marvel comics for the past 30 years. I read the Infinity Gauntlet when it first came out. So I’ve been spoiled since 1991. The only thing that could be spoiled for me was how much of Infinity Gauntlet they would actually put on screen? But you know what? After seeing the movie I realized that was a stupid question and misses the point entirely. The marketing has been telling us that ten years of Marvel movies has been leading up to Infinity War. But actually, It’s been leading up to Marvel Two-In-One #51. Stay with me for a second. 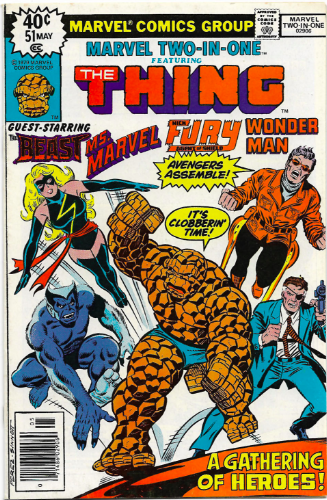 Marvel Two-In-One #51 featured The Thing (from the Fantastic Four) as he hosts a floating poker game at Avengers Mansion. When a SHIELD Helicarrier is attacked, the heroes put their cards down to save the day. The Thing plays poker with an Avenger, one of the original X-men, Nick Fury, and Ms. Marvel. They banter, share beers, crack jokes...it’s the most amazing comic ever. The Beast hold his cards with his feet! THIS is the comic book I thought most about watching Infinity War. This is why the Marvel movies work. Because they have complete confidence in the charm of the characters and settings that have appeared in their comics since 1961. They don’t slather a desaturated patina of grit over its surface to hide their four-color origins. They give a toybox of action figures to creative people and tell them to dump it all out on the floor and play. Lots of people write movies. Taika Waititi teamed up Thor and the Hulk for a cotton candy adventure in outer space. That’s not work. That’s play. That’s Marvel Two-In-One #51. Avengers: Infinity War is pure spectacle. It really doesn’t make a lot of sense even in the context of the last ten years of Marvel films. Thanos is a dumb villain. I don’t mean dumb in concept, I mean he’s stupid. He wants the infinity stones so badly he gave one away in the first Avengers and ended up losing two. In Guardians he tasked Ronan to bring him the power stone when all he had to do was go to the dead planet it was sitting on and take it. Marvel has been hiding Thanos in the background, stalling, waiting until they had enough heroes introduced and interconnected to go against an almost omnipotent foe. And that’s fine because it’s fun. And it’s fan service. And who cares? The world is a scary place right now. It’s okay, and maybe even a little essential that some of our movies are stupid fun. Not everything has to be Shakespeare. It’s okay for some things to be matinee serials. I can’t wait for everyone to see it because I’m really excited to talk to friends about it. I have favorite moments, I have complaints, I have theories. I can't wait to see what they do next. Go see Infinity War as soon as you can.